There were 46 species of ladybirds which had been recorded in Britain until 2004 when the first Harlequin Ladybird was seen in Essex. Since then it has expanded its range rapidly - by the end of 2007 it had been seen in Scotland. The first record in Nottinghamshire was in 2006.
been released as a biological pest-control agent. It was also released in the United States of America in 1988, again in an effort to control small insect pests, and is now the most abundant species of ladybird there. 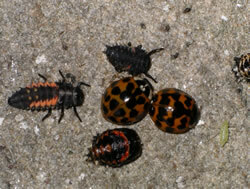 Undoubtedly the arrival of the Harlequin Ladybird is bad news for our native species. It can be bad news for householders when their houses become infested by vast numbers of these ladybirds. It is also bad news for biodiversity - this one species could lead to local or national extinctions of several other species of insect which help keep pestilential species in check. The first, unwelcome, sighting in Beckingham was on 3rd November 2007. A large number were seen swarming over a house and garden wall in High Street. There were individuals at both larval and adult stages. There were also many aphids on the same wall but none of the ladybirds were seen attacking them. It is quite likely that this is not the only colony in the village and also that 2008 will see many more sightings here. Although the species is very variable in appearance, it is not difficult to identify. For information about identification, latest details of its spread, life cycle, ecology, problems it can bring and possible control measures look at the Harlequin Ladybird Survey web site This site also allows sightings of the species to be recorded and mapped.